It sure came up on us fast but we're already at the mid-season finale for Into the Badlands! 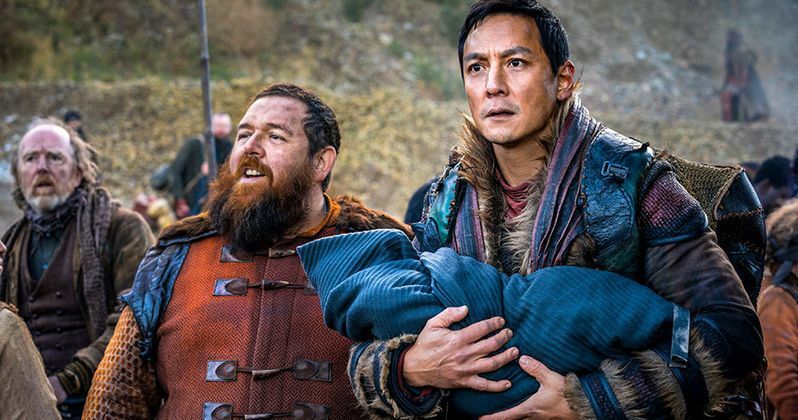 It's definitely been a good mix with the Baron war, Sunny (Daniel Wu) trying to get little Henry cured, and Pilgrim's (Babou Ceesay) quest to find Azra. The best thing is that this is only the half-way point so we have a lot more to look forward to! We open Leopard Catches Cloud with a shot of The Master (Chipo Chung) at the monastery who we haven't seen in a very long time and personally has been a big unanswered question for me. She has a very troubled look on her face and announces the phrase, "It has begun." That is about as loaded of a statement that one can make so who knows what threat is possibly coming. Over on the shores by Pilgrim Island, Sunny and Bajie (Nick Frost) are strolling in with the dozens of refugees who are hearing about Pilgrim's cause and want to join. But they come upon an unexpected surprise when they see M.K. (Aramis Knight) at the camp and are assuming this would be a happy reunion. They would be very mistaken as M.K. approaches Sunny huffing and puffing his chest and demands he gives the baby to Bajie. Even though he is very confused Sunny does so and when he does M.K. attacks him with his fists flying. They tussle back and forth with Sunny playing defense until M.K. activates his Gift and kicks Sunny into a small steel plant. M.K. follows him inside and Sunny ups his game when he realizes that M.K. is playing for keeps. While their fighting continues I'm just wondering where the hell this steel plant came from in the middle of nowhere? It sure makes for some pretty theatrics with all the sparks going off during their fighting. Even though Sunny is more experienced, the power of M.K. 's Gift is too much for him and he loses this battle. He most likely would've lost his life as well if Pilgrim had not intervened and used his powers to knock M.K. unconscious. They return to Pilgrim Island where Cressida (Lorraine Toussaint) tends to Sunny's wounds and keeps calling him by the name Sanzo. Sunny questions her on why they keep calling him that and she says it makes no sense that he doesn't know this name since he contacted them. But Bajie quickly clears up the misconception that HE is the one who sent them the message from the tower. Now that he is awake, Pilgrim enters the room to talk to the one he calls "brother." As they walk through the museum, Pilgrim tells Sunny how they used to be young boys together in Azra and they were the "chosen sons" meant to bring peace. But then the Black Lotus came and attacked their city and he tells how Sunny and his older sister Kannin are the only reasons he escaped alive. Apparently, they got separated and Pilgrim has thought Sunny was dead all these years until the signal got sent out. Talk about big reveal time! So Sunny grew up with Pilgrim AND has a sister?! While he is still processing all this Sunny still hasn't forgotten to ask if Pilgrim can help Henry. He says he can't cure him but with his help, they can "shape the Gift to our will." He goes on to say that they can become Gods and help save "this wretched world." This guy sure dreams big, doesn't he? At the Sanctuary, the Widow (Emily Beecham) talks to Gaius (Lewis Tan) about having to come up with a new plan to end this war because it is costing too many lives. Gaius tells her of secret tunnels they can use to get inside Chau's (Eleanor Matsuura) home called White Bone and take her out. The Widow says they will have Moon (Sherman Augustus) use all of their Clippers to storm her property and be a distraction so it will take the bulk of her forces away from the base. Minerva questions Gaius on his loyalty and says she really needs him to be certain that he can carry out killing his sister. He tells her that he has never had any loyalty to any Barons before and he doesn't care about titles or territory---he just wants to serve her. Can't help but be amused that he has it so bad for a woman called the Widow but in his defense, he did know her before she got that name. She takes his hand and kisses him which seems to signify that maybe Minerva has finally found a man she can trust. Checking back in on Pilgrim and Co., after all of his worker's efforts they have uncovered the giant hatch to the Meridian Chamber and when Pilgrim opens it a large room full of computers and sensors is inside. The strange part is even though the place appears to be a control room of some sort, the ground is covered in sand and there are large stone pillars inside. Almost seems like someone took it over and remodeled it after it was initially built. Cressida notices a small circular spot that is empty and when Pilgrim places the compass into it all the machines turn on. No wonder everyone has been treating those devices with such importance. Lydia (Orla Brady) visits Moon in his chambers as he is getting his blade ready for battle. She asks him about his decision to lead the Widow's forces into battle the next day and he tells her he will be taking her Clippers as well. She corrects him by saying that she will be the one leading her people out there because they need to see their leader taking charge. Moon shows concern because she is not a warrior but Lydia lets him know that she has plenty of experience that she got while she was married to Quinn on how to strategize battles. She adds that if the Widow falls in battle then the people will need to see their new leader is not afraid of being there with them. Moon makes the comment that neither one of them might live to see the next day and a warrior knows every night could be their last. With that big line of subtext, Lydia approaches Moon and kisses him. There is a whole lot of loving going on in the Sanctuary tonight! The next day as they prepare to leave for their assault on White Bone the Widow takes Lydia aside and gives her a small crossbow because she is "going to need more than luck out there." She thanks her for believing in her cause and Lydia replies by saying she looks forward to celebrating their victory together. In the unlikeliness of pairings, Bajie is hanging out with Cressida in her chamber of witchcraft when he comes upon one of her books that talks about the Meridian Chamber. He brings it to her attention that it must be what they have been looking for all this time and she confirms his statement. She goes to tell him that the chamber is where the Ancient Ones unlocked the Gift 500 years ago but they couldn't handle its power which is part of the reason the world is in the post-apocalypse state it is currently in. But now that Pilgrim is in the mix she believes he will be able to harness the power when they release it again and create a new Azra. Or as Bajie puts it, they just want to make a whole new army of Dark Ones. Whether it's Bajie or Cressida's plan that you believe we now know their agenda. Sunny has the insane idea to go talk to M.K. in his quarters because even after almost getting beat to death he still wants to catch up on old times. Sunny has a question but before he can even ask it M.K. confronts him about the fact that he killed his mother. Sunny is at a loss for words because he honestly can't even remember the woman at all so this just frustrates M.K. even more. He blames it on the fact that he was just a "mindless butcher" working for Quinn back then. As M.K. turns to leave Sunny is able to at least ask him if he should trust Pilgrim to help his son. "Everything Pilgrim promises come true," M.K. answers. Looks like Sunny is going to have to embrace the fact that Pilgrim is his best shot for curing Henry. When Bajie finds Sunny with the new information he has learned he tries to convince him that they need to leave because Pilgrim is just using him to get the Gift for himself. But Sunny won't go anywhere since he needs Pilgrim to cure Henry. Realizing he has to take matters into his own hands, Bajie slips into one room where they keep some explosives and grabs a whole crate of them. But unfortunately for Bajie when he comes out Sunny and Pilgrim are right there to apprehend him and he is sent to the Chamber itself to witness the machine get turned on. The time has come as Moon leads the Widow's fighters into battle against Chau's forces in a massive display of swords, blood, and flying projectiles being hurled from catapults. Where did those come from by the way?! After charging into the fight on horseback, Moon gets shot with an arrow in the shoulder and ends up on foot. He valiantly glides through any oncoming foes by slicing them up with his blade until he gets to a point where he is overcome just by sheer numbers against him. As he drops to his knees and his sword hits the ground it seems like we might finally lose him until Lydia appears with her Vanguard group and evens the odds. Moon had ordered her to stay back and hold the line from any of Chau's forces getting through to the Sanctuary but she knew the opportune time to strike. Her timely intervention tips the scales and sends Chau's soldiers to retreat. Everything points towards time to celebrate until Moon and Lydia make their way back to shelter and Lydia almost collapses. Moon sees that she has been severely wounded and is fading fast. She asks him to hurry and get her back to the Sanctuary because "There's so much left for us to do," she says. Get her on the horse and get going, Nathaniel! While all of this has been going on, the Widow, Gaius, and Tilda (Ally Ioannides) continue with their plan to sneak into White Bone and take out Chau. When they do get inside they are not subtle in their attack and Tilda takes on the bulk of the Clippers so Minerva and Gaius can move on. They run into Baron Chau and her right-hand Otto (Wayne Gordon) who are more than ready for them. As they split off to fight the Widow goes after Chau while Gaius gets a rematch from the refugee camp with Otto. The theatrics of sparring while going through different rooms of the house are brief and I wonder if they were either out of time or money because this should've been a bigger fight since we've been waiting some time for it. While Gaius eliminates Otto by slashing his throat, Chau leads Minerva into a huge room where she has archers on the ground and on the level above all aiming at her for the kill. She says she knew what the Widow might be planning so she prepared for it and she adds the stinging remarks of how her brother used to pick a different Cog girl every summer as his new "project" so Minerva shouldn't feel special about his affections towards her. Like the fighting wasn't enough the women have to get catty as well. Chau gives the signal and all the archers shoot off their crossbows but something magical happens as all the arrows freeze in midair. After everyone has a second to assess this strange occurrence they are redirected and shot back at the archers killing them all while Chau is just wounded in the shoulder. While Minerva stands shocked by what has just happened her answer comes in the form of The Master who reveals herself from the shadows. What...the...hell?! She walks up to Minerva and tells her simply that they don't have time for her "little war" because "something far more dangerous is coming." With that, she uses her mystic power and taps Minerva with two fingers to her forehead rendering her unconscious. But does she have to carry her back or is she just going to leave the heavy lifting to Gaius? Sunny, Pilgrim, Cressida, and a reluctant Bajie are all now in the Meridian Chamber and are ready for the moment that at least three of them have been waiting for. Cressida passes Sunny and Pilgrim each one of the compasses and when they place them in their holders the machines in the Chamber activates and hums to life while emitting colors that make the room look like an EDM stage at Coachella. Sunny apparently is the one to "awaken" the machine and walks up to one of the pillars and it lights up from is touch while some strange symbols begin swirling around inside. Almost looks like a breakfast cereal bowl which is getting me kind of hungry. After that, Pilgrim approaches the same pillar and taking Henry into his arms lays his hand on the pillar as well and while they both have their hands placed the black magic from Henry's Gift flows into Pilgrim's body. We can see his veins enlarge while the energy travels into his face and Henry's complexion is now clean and pure. Sunny now relieved that Henry seems to be cured thanks Pilgrim for saving his son's life but Pilgrim instead just replies with, "No, Brother. Thank You." His eyes have changed to pure black as he has absorbed all of Henry's Gift and we can only imagine how powerful he is now. Sunny might have saved his son's life but it looks like Bajie was right and the world is going to need some saving. That's all for now and they sure left us with a lot to go on! What will be Pilgrim's objective now that he has the Gift? Will Sunny still work within Pilgrim's ranks or leave on his own? Will the Widow be asked by the Master to fight Pilgrim or is it something else? And why is Odessa gone because some of us would like her back?! Just saying.